Google Ads amounts to billions of dollars in revenue for the search engine giant, but what about your revenue? Standing out in this competitive—and, let’s face it, cluttered—environment can be a huge challenge for advertisers, especially if they’re just starting out. There’s only so much space on a search results page to go around, after all. As we enter the 2018 holiday season, it’s the right time to take a good, hard look at your stale ads. It’s time to breathe some new life into them. Google made their standard text ads larger by introducing expanded text ads (ETAs) in 2016. The increased character count was a boon for advertisers because it enabled messaging to reflect more of the advertiser’s key incentives. Experts jumped on this new format immediately, even though Google didn’t require they switch until January 2017. Even then, advertisers could continue to run standard (shorter) ads, but they couldn’t edit them or launch new ones. Some people hesitated, but advertisers who were slow to switch were at a disadvantage compared to those who immediately moved to the new format. The go-getters ended up with a huge head start since ETAs proved to have higher clickthrough rates (CTRs) than standard ads. Now you have this opportunity again! In August, Google further expanded their text ad format—expanded expanded text ads?—but taking advantage of these new character limits is still optional (hint: you should use them). 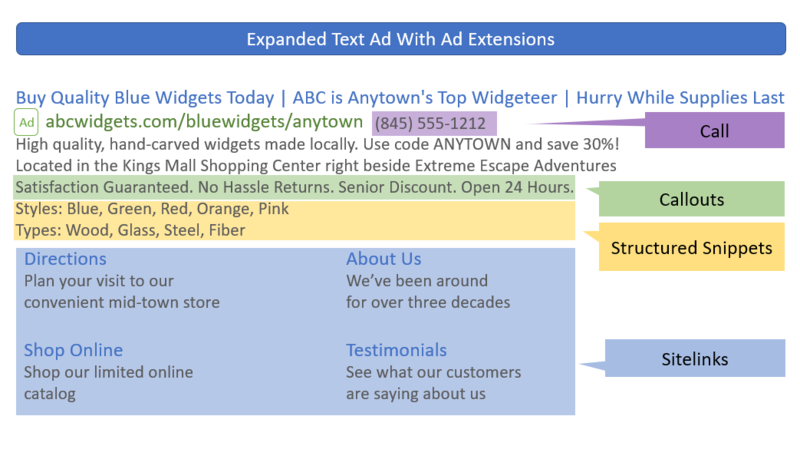 Google’s expanded text ads give you more space to connect with prospects. An example of how these ads appear in the search results. The new ETAs feature up to 218% more text than the original “standard” format. 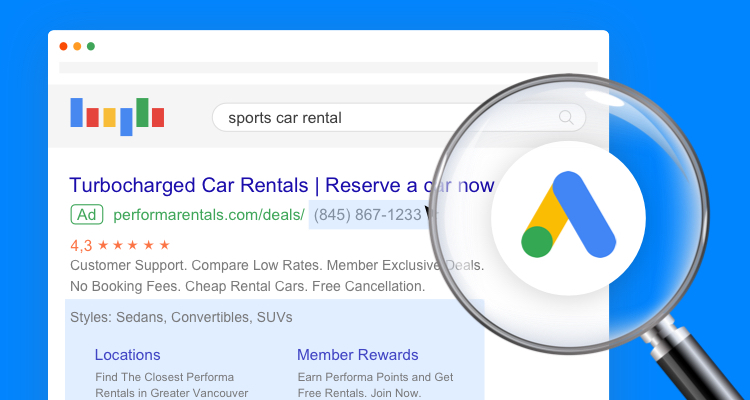 As expected, search experts are already updating their ads to capitalize on the latest change—and this time you should too! Even though the extra headline and description won’t show up all the time, they’ll help you stand out when they do by making the ad itself bigger. The third headline also gives you an extra thirty characters of highlighted blue text at the top of your ad. Ad extensions are optional snippets of text that users can append to their ads. Google introduced the first extension—sitelinks—way back in 2009. These short links appear beneath the ad and direct searchers to different pages of the advertiser’s website. Google ad extensions are free to implement and often improve your ad’s CTR. On average, an ad’s CTR has the potential to improve by 10-15% per extension. Aside from adding functionality, extensions increase the surface area of your placement and are free to implement, so they’re a no-brainer. Though every ad extension is potentially useful, there are four (highlighted in yellow above) that you must use (if you’re not already). This is because they’re easy to implement and they allow you to feature critical incentives and information about your business that would otherwise take up valuable ad copy. Sitelinks are valuable because they allow you to link deeply into your site. The number of sitelinks associated with your ad varies from 2 to 8. A great tip is to create specialty landing pages for each sitelink which are goal oriented and customized to the link. You can customize sitelinks at the ad group level too, making them even more relevant to specific searches. Expert Tip: The Unbounce Builder is an excellent tool for quickly creating landing pages that match your ads’ sitelinks. Callout extensions can be up to 25 characters each and are not clickable. They promote features, benefits, and selling points of your business. They’re also a great way to highlight specific qualities of your business that you don’t have room to showcase in your primary ad copy. For instance, 250 5 star reviews, 5 convenient locations, all credit cards accepted, etc. Call extensions add a phone number without wasting any of the primary copy. On mobile devices, a callout extension lets people tap a button to call your business directly. Implementing call extensions is quick and easy, so you should include them in all applicable ads. This extension gives users the option to include a list of products or services beneath their ad. Structured snippets contain a category header (e.g., services) followed by a list of items (e.g., pet grooming, pet sitting, dog training, de-shedding). 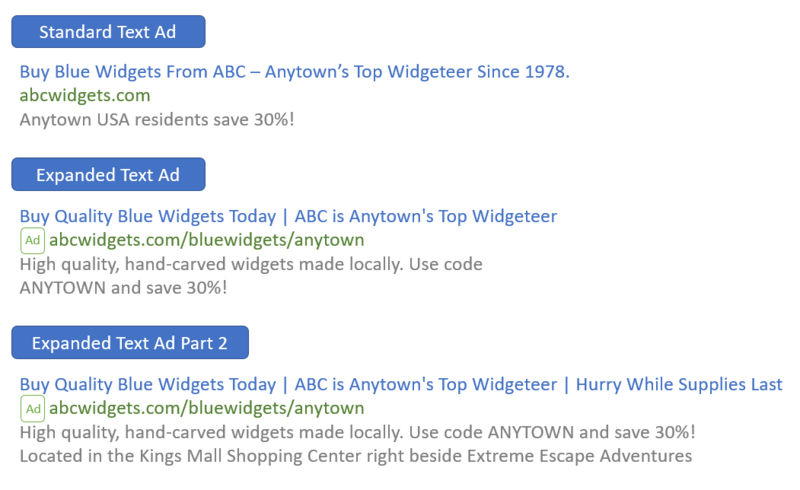 Using all of these snippets is a great way to differentiate your ad from competitors’ ads. You can get creative too. For example, if you’re a B2B database host, you could list the features included in your service (e.g., Cloud Automation, Advanced Security, Easy-To-Use Data Browser). Using a few of the available extensions creates more opportunities to capture your prospects’ attention. It can even push your competition further down the page! 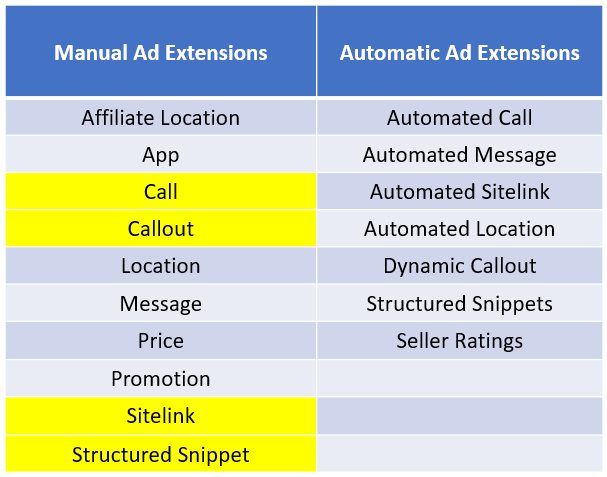 An ad with structured snippets, call, callout, and sitelink extensions enabled. Expert Tip: Not all ad extensions show up all the time, and they appear differently on mobile devices versus desktops. Google’s system tries to match the most appropriate extensions to the most relevant searches. Implementing ad extensions along with the latest ETA format is sure to get advertisers more clicks. Yet this can be a double-edged sword because (sadly) most of us don’t have an unlimited budget. Fortunately, there are some settings and features that you can (and should) use to minimize clicks from unqualified traffic. The settings we’re going to focus on are bid modifiers, geotargeting, remarketing for search ads (RSLA), ad scheduling, and negative keyword lists. Bid modifiers, or adjustments as Google calls them, enable you to increase or decrease bids based on when and how people search. Bid modifiers can apply to devices, locations, ad scheduling, and more. Advertisers bid up or down by percentages. For example, if you want to bid more aggressively on mobile searches, you can adjust your bids to +30% for mobile devices. Likewise, if you want to appear for desktop searches, but would rather pay less for these types of clicks, you can adjust your bids to -30% for desktop devices. Expert tip: Use Google’s reporting tools to test how your modified segments are performing and adjust bids regularly. You can review performance by location, audience, device, time of day, and more right from the Google Ads main interface. There’s more to geotargeting than just showing your ads in your desired locations. You can also refine where your ads appear by excluding certain locations and regions. You can get granular with this too by increasing or decreasing bids to your targeted areas using bid modifiers. Geotargeting improves your ROI by minimizing clicks from unqualified prospects (e.g., people outside of your service area, neighborhoods below a certain income threshold, etc.). So it’s well worth the time it takes to set up and refine. Maybe you’re not open on weekends. Maybe no one is operating the phones after 8 pm every night. Maybe your strongest return on ad spend occurs between the hours of 10 am and 1 pm every day. Once you figure out the best time of day for your ads to appear, you can use scheduling to choose exactly when they show. This is an especially great feature when you have a limited budget. Remarketing isn’t just for display ads anymore! This feature allows you to target search ads to people who have already visited your site. Your ads then appear when they search on Google for the keywords you’re bidding on. You can either append RSLA lists to existing ad groups or create groups that only show ads if a searcher is on your remarketing list. Google provides detailed instructions for setting up RSLA campaigns. It’s definitely worth investing the time to read. You can ensure your ad isn’t triggered for undesirable keywords by creating negative keyword lists and applying them at the account, campaign, or ad group level. The new Google Ads interface makes creating and assigning negative keyword lists simple. Create themed lists (e.g., competitors, locations, common terms) and assign them based on account performance or structure. Expert tip: Check out Google’s search terms report to see exactly what people are searching for when they look at your ads, and then use this info to build your negative lists. The good news is that there are things you can (and must) do to make your brand stand out and to ensure it’s reaching the most qualified prospects. Google gives you some powerful tools to help improve the clickthrough rate of your ads, which contributes to a higher quality score. And, in turn, higher scores help drive down your cost per click, give you a higher impression share, and make your ad more likely to show up than your competitors’. They can even help your ad appear at the top of the search results. But blindly implementing these tips can only help you so far. It should go without saying (but we’re saying it anyway) that you should test all ads with different ad copy (and extensions) and then refine them based on actual performance. Effective ads—even those loaded with ad extensions—are also only part of a good PPC strategy. Landing page optimization, tracking, A/B testing are critical practices for a successful campaign. Setting clear goals is also very important. It’s also helpful to see what the competition is doing by reviewing competitor ads, landing pages, and incentives. Google’s Auction Insights report allows you to see who is bidding against you and their impression share compared with yours. Make sure you’re reviewing your competitive data monthly or quarterly. It can help you plan and revise your keyword and ad copy strategy. Industry tools like SEMRush, KeywordSpy, and SpyFu also provide competitive information and enable you to automate monitoring. They’re worth checking out—you can be sure that most experts use them! Even if you don’t dig deeper into the competitive data, however, implementing the above settings and ad extensions—as well as taking advantage of the latest expanded text specifications—will put you ahead of the competition. So get started today!